What lies between us are secrets and lies and memories we've chosen to forget or change or block out. This premise is at the heart of What Lies Between Us. As the book opens, we’re introduced to a character in jail. Initially we’re not sure why she’s in jail, only that she receives hate letters from mothers and that she, herself, is a mother. Because she’s in jail, we know that she’s committed a crime, but we’re not really sure what that crime is. What we do know is that she does not seem remorseful. I would go as far as to say she’s very matter of fact about whatever it is she’s done and that’s a bit disturbing. “People write to me. Mothers, mostly; they spew venom. That’s not surprising. I have done the unthinkable. I have parted the veil and crossed into that other unseen country. They hate me because I am the worst thing possible. I am the bad mother. Before this character tells us what she’s done to land in jail, she takes us back to her childhood in the hills of Sri Lanka. Hers sounds like an idyllic upbringing. The only child of a wealthy professor and stay at home mom, she’s alternately adored by her father and ignored by her mother. A frail woman, her mother keeps her distance from her, meting out affection as one would ration food for a dog. So desperate is the daughter for her mother’s attention that she sleeps outside of her door in hopes of seeing her in the moments when she briefly leaves her bedroom. In his sober moments, her father lavishes her with attention, but her constant companion is the family servant, Samson. He is the one that takes her to play by the stream and pulls thorns from her fingers when they’re pricked. But as she gets older, she begins to receive unwanted attention from Samuel and is almost relieved when she and her mother are forced to move to America. There, she transforms into a typical American teenager with the help of her cousin Dharshi. And though Dharshi is her closest friend and ally, the secrets of first Samson and later Dharshi’s marriage lie between the two. Eventually she moves into a relationship with Daniel and things are perfect. Even in his overly white world, she finds a way to fit in, but cracks in her armor slowly start to appear so that by the time they’re married, you already know that she’ll find a way to ruin things because you can only keep secrets for so long before they take over your life. And those secrets bring us right back to the prisoner we met in the first few pages. When I tell you this book did me in? It was sad, not sad in that “can I cut my wrists already” way that A Little Life is, but it’s sad. And that’s not to say that there are no happy parts, because there are. The protagonist’s life is happy overall in those moments when she’s by herself, before she’s a part of a couple, when she’s no one’s daughter. When she’s allowed to be her own person and fully live in her truth, she seems to be fine. But the secrets and the memories she’s kept and suppressed overwhelm her and they drown out her happiness. Yet, I couldn’t stop reading. How into What Lies Between Us was I? I didn’t even realize until the end of the book that no one ever uttered the character’s name. We don't even learn it until the end. It didn’t matter. 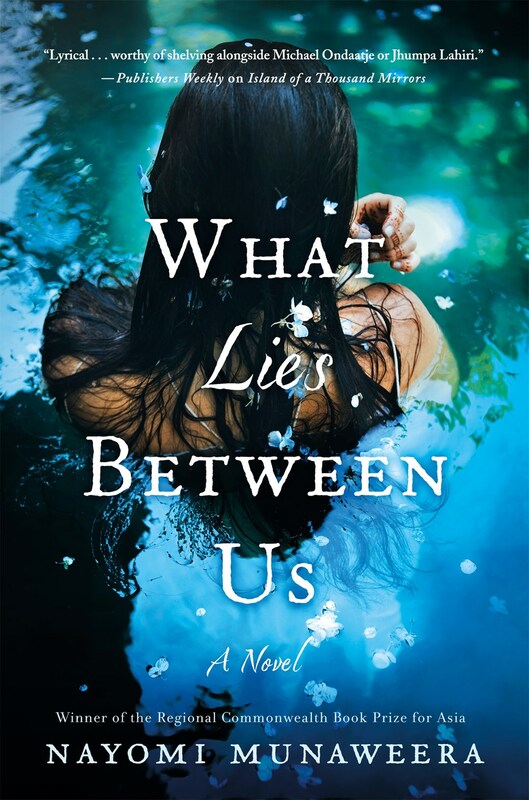 The story line, the descriptions of life in Sri Lanka, the adaptation of a teen immigrant to America, the character’s emotional and mental states – Nayomi Munaweera does an amazing job of handling all of these.